Last summer I traveled with my immediate family to Rhode Island and New Hampshire to be with my extended family for a wedding. All the activities were amazing and fun, but I think one of the best parts and a part that I always look forward to is the time I spend with my brother. As I have written before, my brother and I always end up on some adventure; usually more than what we had planned for. 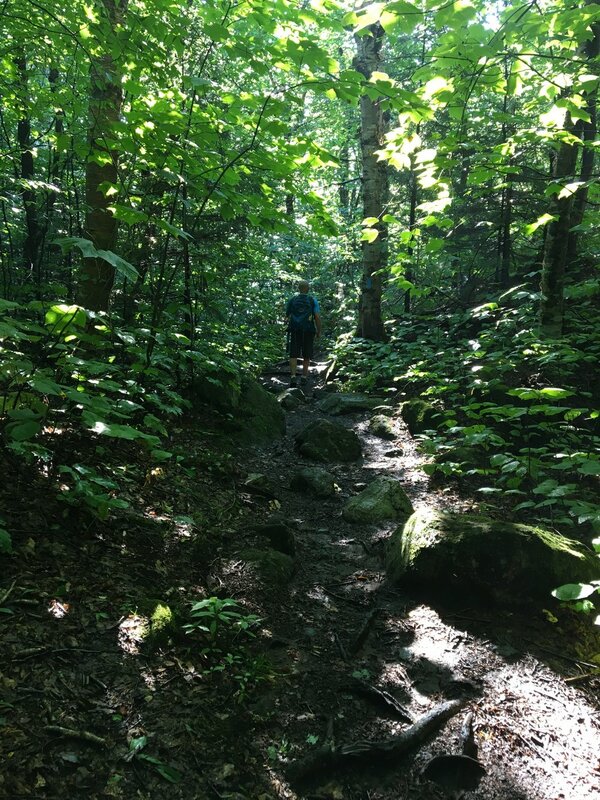 So when we talked about heading up the back side of Mount Sunapee, I was excited because I knew it would be fun and would include something kind of surprise adventure. We tried to recruit our sons to go along, but with a 6am departure, it is tough to get teen age boys to commit. Dave and I awoke and started up the trail head to the top. It was a low cloudy day, but the sun was supposed to break through it at some point. As we jumped creeks and mud puddles created from the rain the previous day, I found myself just enjoying being together with the guy I had grown up with for more than 47 years. We continued our run / hike up the mountain through the fog as each step was a challenge on the wet slippery rocks and roots of the trail. We climbed to higher elevations with every step and the sun became more and more evident as it’s beams began to penetrate through the billowy low clouds. As we passed the level of the clouds and came up on Lake Solitude’s clear skies, we took every step slow on the quiet pine needle floor of the pine woods that surrounded the lake. We thought that maybe we would see some type of wildlife, but as we got closer we saw no signs of any movement. We sat and just enjoyed the quiet and talked to each other in low toned voices hoping that maybe we would see something….nothing. We decided to move on to the top of the mountain and off we went. Once Dave and I decide to do something, it doesn’t take long for it to happen. Within a matter of 10 minutes and after climbing a number of rocks and hills, Dave and I were viewing one of the most amazing views I have experienced in my life which you can see in the picture behind the title of this blog. I have been to higher places and seen amazing sunsets, but there was just something about this view. We sat just amazed by it together. After a while, we decided that we better head back to my sister’s home on Mountain Road as we knew the rest of the family would be getting up soon. As I reflected on that day and the time with my brother, there was no exciting adventure that occurred except for our excursion up the mountain, but what did happen was that he and I experienced one-on-one time alone together in a place where we made memories. Cesare Pavese, an Italian poet, said that “We do not remember days; we remember moments.” I definitely will remember those moments with my brother. Why? I think it was a combination of being with someone that I truly love and love to be with and an amazingly beautiful place that God created here on this earth. Our lives are moving so fast and I wish I had spent more time making memories like this with the people I love and work with then with all the other stuff I’ve done in my life. How do we change our lives to live more in this way. To share life and memories with those we have the opportunity to lead in our life; our wives, our husbands, our kids, our peers, our managers and our direct reports? Do you think it would make a difference in your leadership abilities? If you do, then I challenge you to make a change. Start sharing your life, make some memories and lead well. I’d love to hear your comments.